How often do you think people buy a home simply because they have fallen in love with the way the kitchen looks, or the fabulous view from the living room window, or the inviting swimming pool out back? Purchasing a new house is most likely one of the biggest purchases you will make in your lifetime and it should be a well thought out decision, not an impulse buy. When you are purchasing a new house it is important to do some homework first. 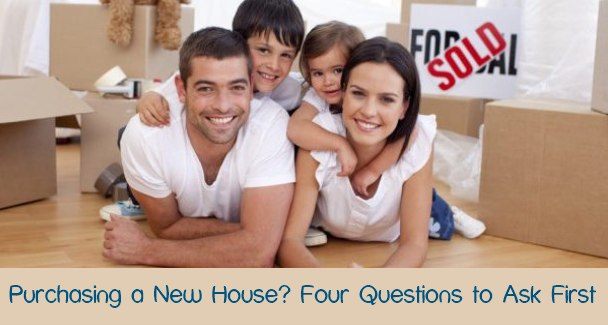 Here are four questions that you want to ask about each house that you consider buying. Of course you want to know how much the house is selling for right now, but you should also see if you can find out how much the current owner paid for it. This will help you determine whether or not the value of the house has gone up, and if so, by how much. You also want to find out what other houses in the neighborhood of similar size and type have sold for recently. Location is a huge factor when it comes to purchasing a new house, for many reasons. You want to find out if the city, and the specific neighborhood, is a safe place to live. How close is the nearest bus stop in case you need public transportation. If you have young children you will want to find out about the local schools and if the neighborhood is geared towards young families. If being able to walk to shops and restaurants is important to you then find out how close they will be to your new house. Or perhaps you want to be close to the beach, or to parks. Go online and look at maps to view the locations that you are considering. You can find out so much, very quickly, simply by looking at Google street view. Read the newspapers to see if there are any negative reports about the location you are considering. And of course, take several drives, at different times of day, through the neighborhoods you are considering buying in. And, remember to think about moving costs, especially if the location of your new house is quite a distance away. When it comes to homesales it is all about timing. By that I mean that the best time for you to buy a home is when prices are lower and many people are trying to sell their home. This gives you more houses to look at, and if there are more homes for sale than there are buyers, you will most likely find a better deal. Everytime you view a house that you are considering buying you want to pay very close attention to the condition of the house. Ask questions about how old the roof is, how old the appliances are, and how old the furnace and air conditioner is. Ask if the house has ever flooded or if any pipes have ever broken. Look for cracks in the foundation and any signs of water damage inside the house. Ask if the electrical and plumbing throughout the house is up to code. Even after asking all of these questions and doing all your homework you will still want to hire a home inspector to inspect the house before you purchase a new house. And always have a good list of questions ready for your home inspector too. After all you are paying for the home inspection so you should feel completely comfortable with what they tell you about the house that you are buying.